How thorough are you when you brush your teeth? Are you making sure you reach those tough-to-reach areas near the back of your smile? Are you making sure to floss as well as brush? Your McKinney, TX dentist encourages every patient to take their daily oral care regimen seriously. With that said, it is important to note that your daily efforts should not feel like a substitute for professional dental exams, and the cleanings you receive during these appointments. Professional cleanings can exceed the quality of care you provide on your own, particularly when it comes to removing tartar, which can persist despite your most diligent brushing and flossing efforts. Every time you visit your dentist for preventive oral health treatment, you enjoy valuable feedback about your smile, as well as care to help you maintain a cavity-free smile. Your dentist can use experience and technology to spot problems that evade your own detection. When you are alerted to unexpected problems, you can receive the necessary restorative dental treatment before you start to feel the unpleasant effects that come with complications. 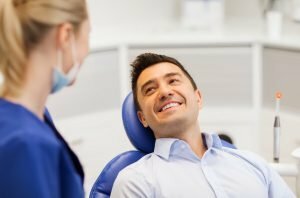 Of course, because your smile is being carefully evaluated and cleaned, you can be less likely to have problems that demand professional dental care. Remember, your best smile care comes from daily habits AND professional exams. Your dentist can give you a thorough smile review, but you still need to take care of yourself in between visits. You should place an emphasis on access, not force – that means focus on cleaning every area of every tooth, rather than trying to brush aggressively to do a better job clearing away plaque and food debris. At Illume Dental, patients who want to avoid problems with tooth decay and gum disease are treated to thorough reviews, and important professional cleanings. To arrange your visit with Dr. Chen, call Illume Dental in McKinney, TX, today at (469) 301-1255. We are proud to welcome families from McKinney, TX, as well as Allen, Plano, Frisco, and all other nearby communities.